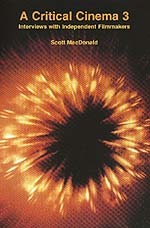 A Critical Cinema 3 continues Scott MacDonald's compilation of personal interviews and public discussions with major contributors to independent filmmaking and film awareness. An informative exchange with Amos Vogel, whose Cinema 16 Society drew American filmgoers into a broader sense of film history, is followed by interviews reflecting a wide range of approaches to filmmaking. Sally Potter discusses her popular feature, Orlando, in relation to the experimental work that preceded it, and Canadian independent John Porter argues compellingly for small-gauge, Super-8mm filmmaking. Ken Jacobs discusses the "Nervous System" apparatus with which he transforms old film footage into new forms of motion picture art; Jordan Belson describes his Vortex Concerts, ancestors of modern laser light shows; and Elias Merhige talks about going beneath the "rational structure of meaning" in Begotten. A Critical Cinema 3 presents independent cinema as an international and multiethnic phenomenon. MacDonald interviews filmmakers from Sweden, France, Italy, Austria, Armenia, India, the Philippines, and Japan and examines the work of African Americans, European Americans, Asian Americans, and Hispanics. He provides an introductory overview of each interviewee, as well as detailed film/videographies and selected bibliographies. With its predecessors, A Critical Cinema (California, 1988) and A Critical Cinema 2 (California, 1992), this is the most extensive, in-depth exploration of independent cinema available in English. Scott MacDonald is Professor of Film Studies and American Literature at Utica College.